It has come time once again to pay tribute to a legend lost, to the greatest of them all, America’s Blue Yodeler, and the Father of Country Music: Jimmie Rodgers. At the time of this posting, it has been eighty-five years to the day that Jimmie walked through those pearly gates, a victim of the white plague at only thirty-five years old. In the wake of Jimmie Rodgers’ tragic demise, numerous songwriters published melodies eulogizing him. Among the most successful of these were Bob Miller’s “The Life of Jimmie Rodgers” and “The Death of Jimmie Rodgers”, recorded by Gene Autry and Bradley Kincaid, the latter of whom also sang “Mrs. Jimmie Rodgers’ Lament”, composed by Rich Kuster. But those were far from the only ones. Songwriters Dwight Butcher and Lou Herscher, who had collaborated with Rodgers in composing “Old Love Letters”, which Jimmie cut at his last session, penned the popular “When Jimmie Rodgers Said Goodbye”, recorded by a fair number of artists, including Autry and radio yodeler Kenneth Houchins, and by Grand Ole Opry performers Asher Sizemore and his son Little Jimmie under the title “Little Jimmie’s Goodbye to Jimmie Rodgers”. Three years after Rodgers’ passing, Ernest Tubb made his recording debut backing Mrs. Jimmie Rodgers (the former Carrie Williamson) on a weepy performance of “We Miss Him When the Evening Shadows Fall”, then he sang “The Last Thoughts of Jimmie Rodgers” and “The Passing of Jimmie Rodgers” himself. Even decades later, Rodgers was still being honored in song by devotees such as Tubb and Hank Snow, two of the countless many whose lives his music had touched. Vocalion 02605 was recorded on October 11th and 10th, 1933, respectively, in Chicago, Illinois. 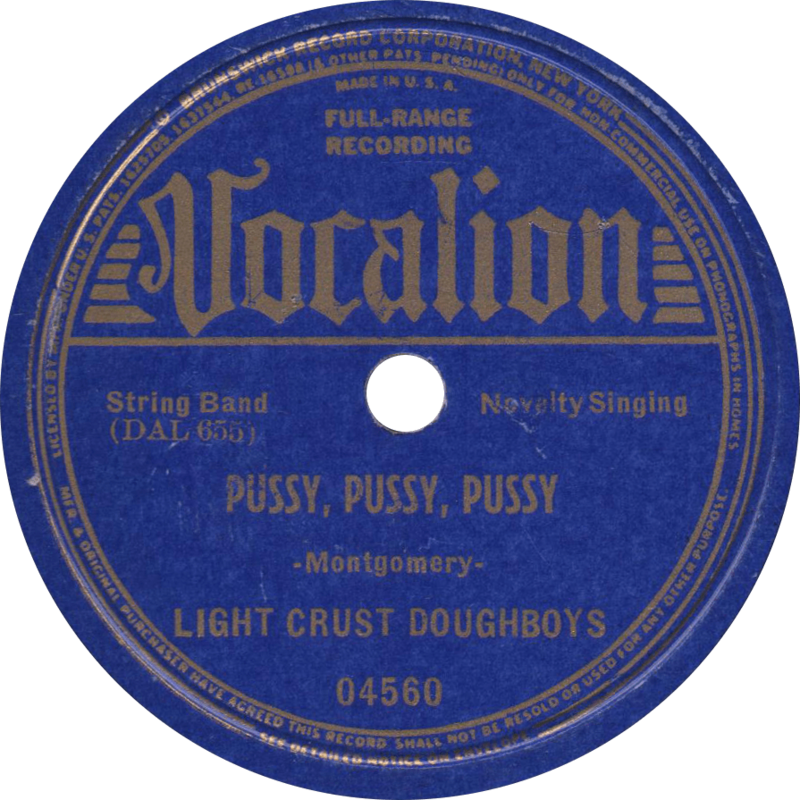 The Light Crust Doughboys are Herman Arnspiger and Leon Huff on guitars, Sleepy Johnson on banjo, Leon McAuliffe on steel guitar, and Ramon DeArman on string bass. Leon Huff provides lead vocals. W. Lee O’Daniel was there, too, but he didn’t do anything on this record. Opening out with a guitar run reminiscent of Rodgers’ signature style, Leon Huff sings and yodels W. Lee O’Daniel’s own tribute to the Blue Yodeler, “Memories of Jimmy [sic] Rodgers” (though either he or the record company misspelled Rodgers’ name). 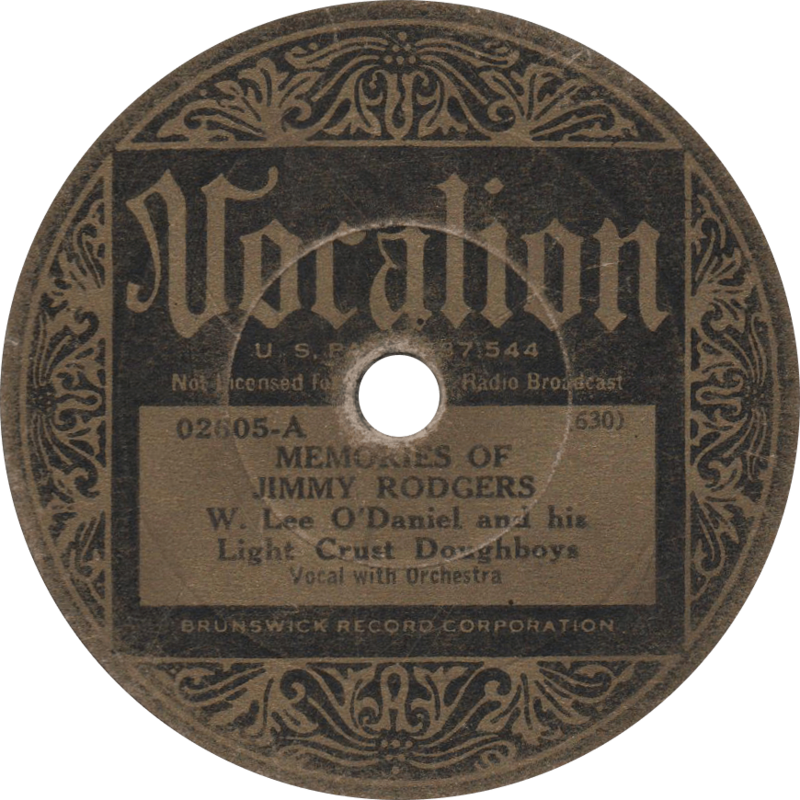 Memories of Jimmy [sic] Rodgers, recorded October 11, 1933 by the Light Crust Doughboys. 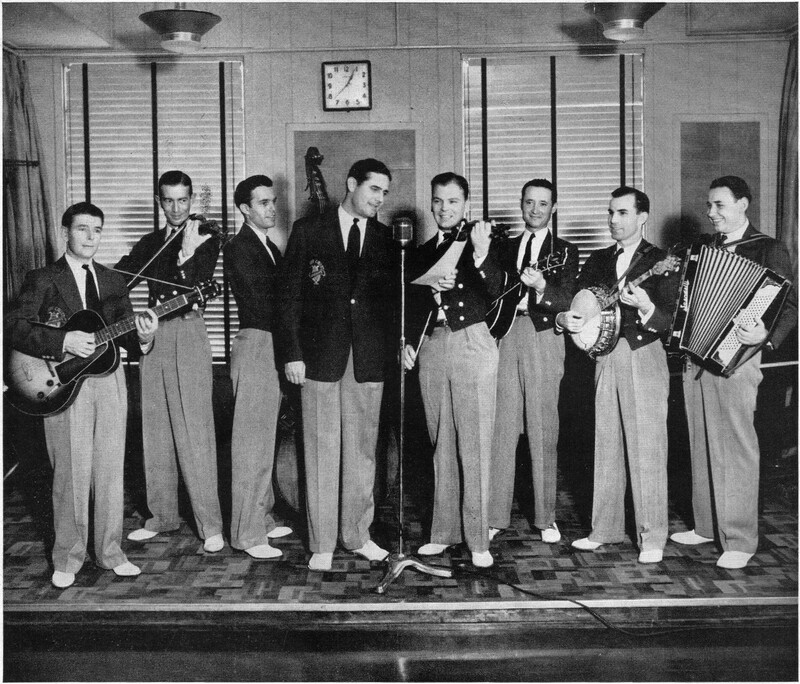 Lightening up considerably from the more solemn tone of the previous song, the Doughboys sing a humorous number poking a little fun at the Depression on the flip, “I Want Somebody to Cry Over Me”, punctuated by Sleepy Johnson’s tenor banjo. 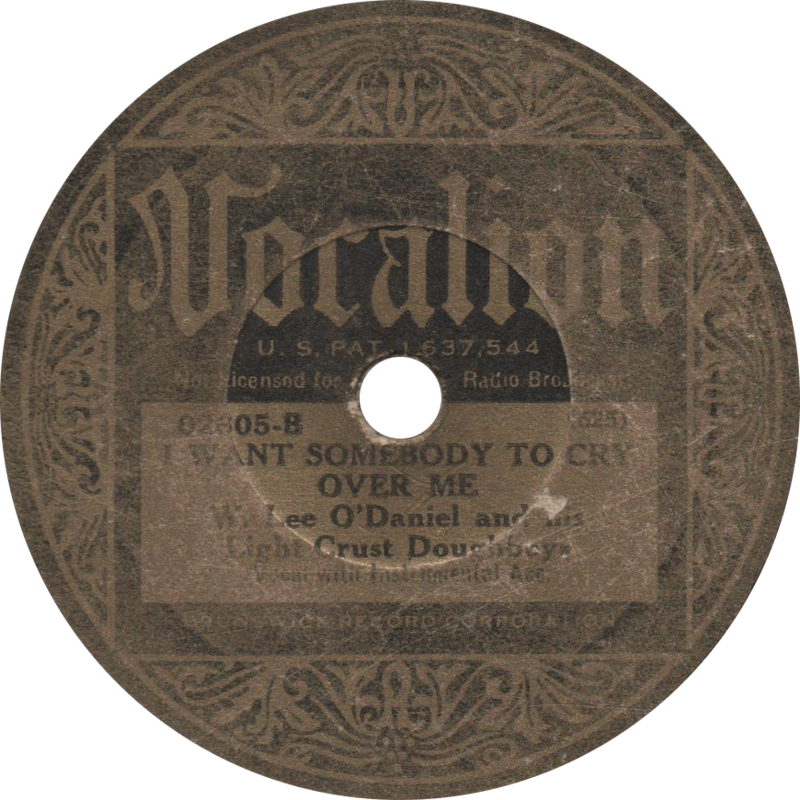 I Want Somebody to Cry Over Me, recorded October 10, 1933 by the Light Crust Doughboys. 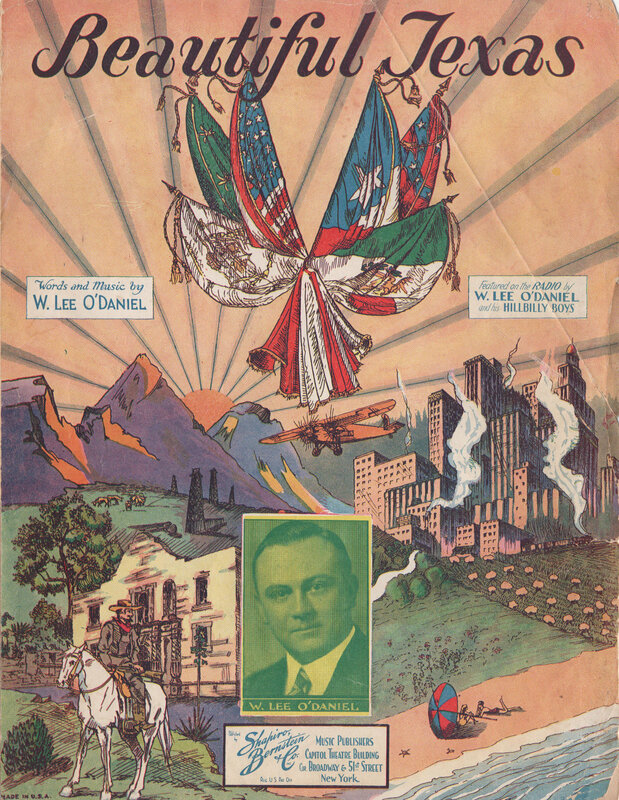 1933 Sheet music for Beautiful Texas, words and music by W. Lee O’Daniel. On March 2, 2016, Texas celebrates the 180th anniversary of its independence from Mexico, and the creation of the Republic of Texas. After ten years as an independent nation, and a hot button issue in United States politics, Texas was admitted to the Union as the 28th state. To celebrate and remember the occasion, here’s two fiercely Texas-themed tunes by the Fort Worth-based Light Crust Doughboys, under the leadership of W. Lee O’Daniel, the radio advertising director for Burrus Mills, makers of Light Crust Flour and future Governor of Texas. 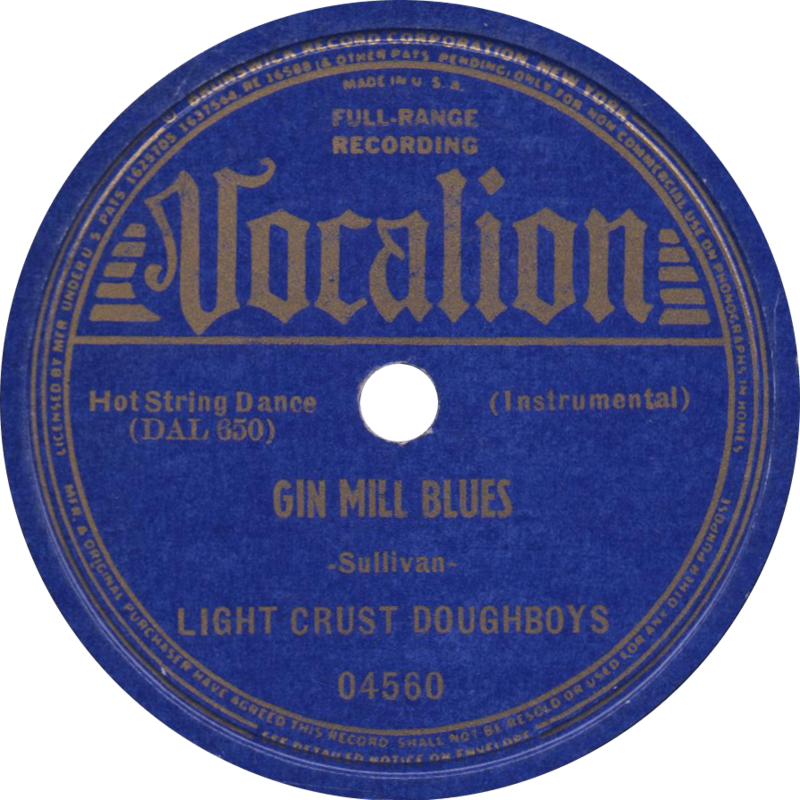 Vocalion 02621 was recorded on October 10, 1933 at Vocalion’s studio in the Furniture Mart Building at 666 Lake Shore Drive in Chicago, Illinois, the first recorded (but not first issued) sides at the Doughboys’ first Vocalion session, and only second overall session, after their 1932 Victor session, which yielded one disc. The band members on these sides include Herman Arnspiger and Leon Huff on guitars, Clifford Gross on fiddle, Sleepy Johnson on banjo and fiddle, Leon McAuliffe on steel guitar, and Ramon DeArman on string bass. Guitar player Leon Huff sings lead vocal on W. Lee O’Daniel’s song, “Beautiful Texas”, proudly boasting of “about six million people who’re glad that they’re here to stay.” A truer song has never been written. 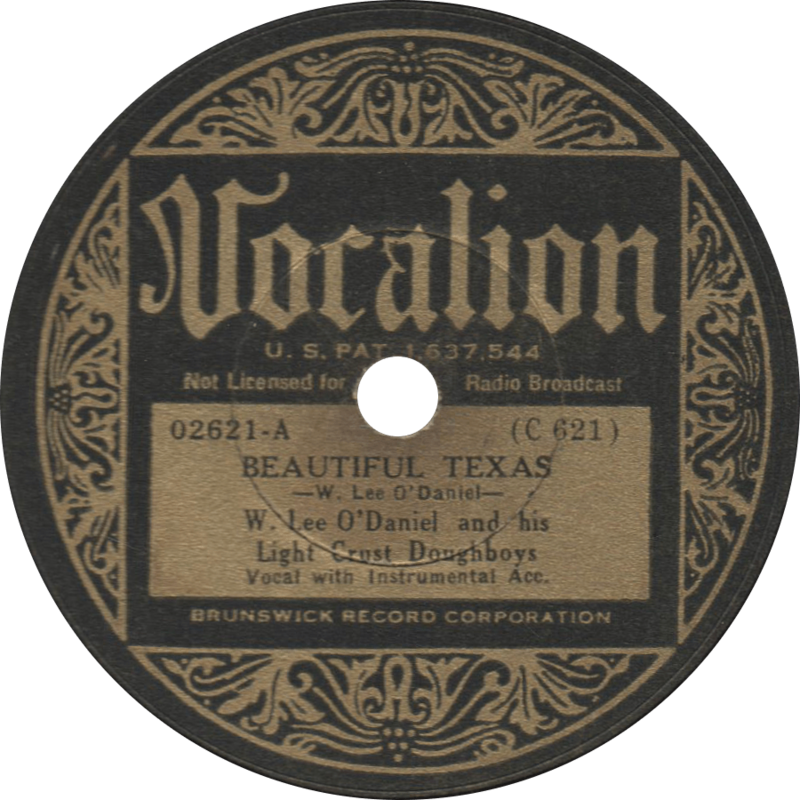 Beautiful Texas, recorded October 10, 1933 by W. Lee O’Daniel and his Light Crust Doughboys. On the reverse, the Doughboys play an instrumental number, “Blue Bonnet Waltz”, taking its name from the official flower of the State of Texas. 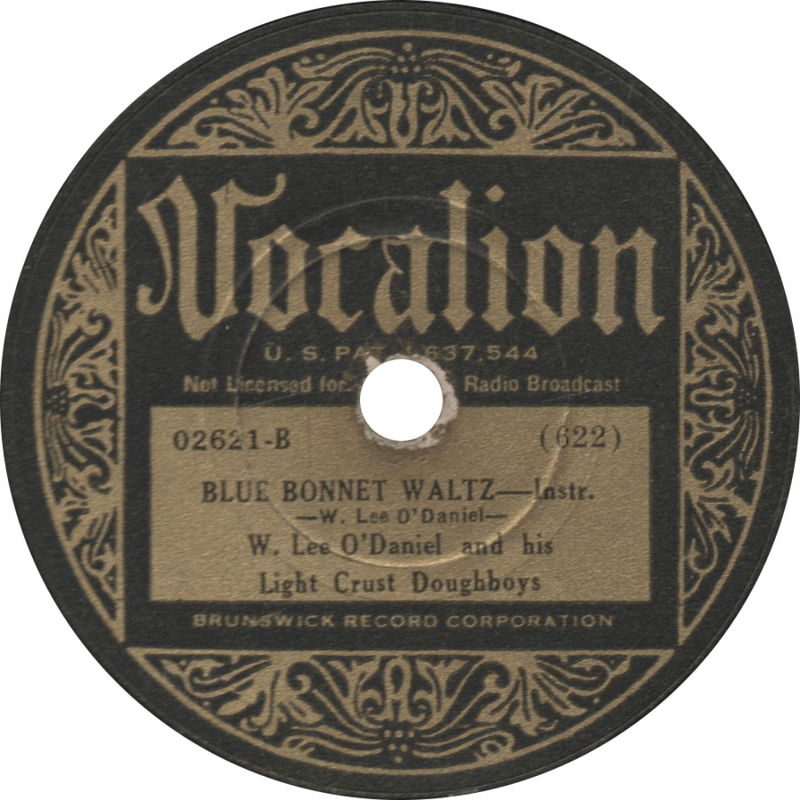 Blue Bonnet Waltz, recorded October 10, 1933 by W. Lee O’Daniel and his Light Crust Doughboys. Updated with improved audio on July 11, 2017. Always tellin’ me about Brady Street, wonder what is on Brady. Must be something there very marvelous, mm-mm-mm!